Precautions for use of Antminers. This applies to all Antminers. 1. Inspect the the miner for aesthetic damage or loose heat sinks. If you noticed a damage or defect, or found loose heat sinks, contact us immediately. 2. Install the miner in a dust-free environment with unobstructed air circulation. 3. Wear discharge static electricity or wear anti-static PPE during installation or maintenance of the miner. 4. Unplug the miner when installing or maintaining it. Otherwise, the control board will be damaged. 5. Use a power source that can offer a power output of 20% more than the miner’s power requirement. When the actual output of the power source does not meet the power requirement of miners, the hash rate will be low. 6. Connect the positive ports and negative ports of D/C power 6-pin connectors of the PSU to the miner's control board and hash boards correctly. If they are plugged wrongly, the PSU will enter protection mode. Moreover, the control board and hash board will be burnt. 7. Use one PSU for one miner. The miner can receive power from different PSUs, but each hash board can only receive from just one PSU. 8. Power the hash boards first, then power the control board. If you are powering one miner with only one PSU, you can power it on immediately after connecting the hash boards and control board. 9. Make sure that miner is grounded/earthed properly. 10. Install lightning protection; otherwise, all equipment may be damaged if struck by lightning. 11. Antminers can only be connected via Ethernet cable and do not support WiFi connection. 12. 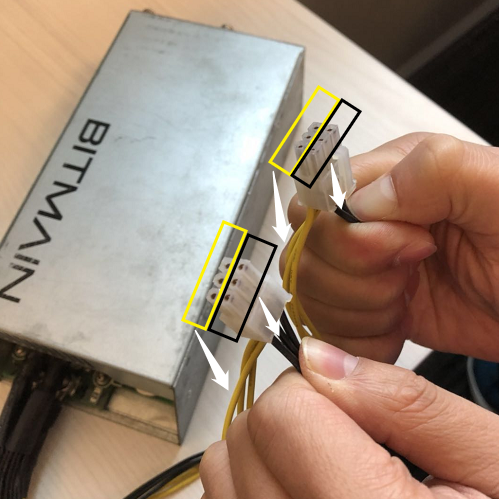 In case of internet connection or network failure, if it could be resumed in 15 minutes, the miners do not need to be unplugged and rebooted. If the failure could not fixed in a short amount of time, power off the miner. Unstable internet connection will cause the miner to crash. Different routers have different settings, consult your router provider to know how many miners can be connected to your router. An internet speed of 1 Mbps can support up to 150 miners. 13. A miner uses an estimated 500 MB of internet connection per month, prepare enough amount of data usage if you are using a data card. 14. Use the supported browsers: Google Chrome and Firefox. 15. Clean and dust the miner periodically. When the air way in front of the heat sinks is blocked, the miner will be affected. 1. Do not use the miner in an enclosed or confined place. Any items blocking the air flow of the miner is prohibited. 2. Do not use place the miner in an environment where there is high condensation or high level of salt content and humidity in the air. The recommended humidity is below 65%. Coastal places are subject to large salinity in the air, which can easily damage the hash board. 3. Do not use the miner at extreme temperatures. It is recommended that the working environment temperature be 5 to 35 degrees Celsius. At low ambient temperature, the hash rate will be low. At high temperature for a long time, the miner will malfunction. 4. Do not use water curtain (for cooling) in a situation where a large amount of dust is accumulated, water vapor will adhere to the dust accumulation area and corrode the hash boards. 5. Use of PoE function switches or routers are not allowed because the control board will be burnt. 6. Do not use touch the connectors of the control boards and fan as they are directly connected to the IC pins. Touching these connectors in the absence of electrostatic discharge will spoil IC which makes the miner malfunction. 7. Do not attempt to use a miner that appears to be damaged.